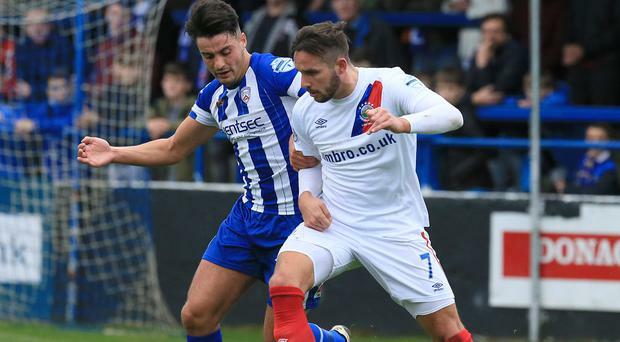 Striker Andy Waterworth admits even if Linfield do qualify for European football it will not paper over the cracks - they just haven't been good enough this season. The Blues are in a battle for a third-place finish in the Danske Bank Premiership, with Glenavon their biggest obstacle. Should Coleraine lift the Irish Cup next month, that would mean automatic qualification for the team that finishes in that position. In an ironic twist, Oran Kearney brings his Bannsiders for a showdown against the Blues at Windsor Park tomorrow. It's a must-win scenario for the North West side if they want to take the title race to the final day of the season, regardless of what happens across town in the North Belfast derby between Crusaders and Cliftonville. Coleraine have been hugely impressive, having lost only one game - against the Blues on November 18 - in their 36 league outings, so they can certainly boast title credentials. Whereas it has been a season to forget for the out-going champions. This time last season they were on the crest of an unbeaten run that dated back to January. Fast forward 12 months they have already been turned over 10 times, leaving them a staggering 20 points adrift of the top two. With stats like that, the players would normally be craving a curtain-call to the season, but they still have the chance of salvaging a little bit of pride by grabbing a money-spinning ticket to Europe, either by finishing in that third position, or through the end-of-season-qualifiers. "It could end well, but it still doesn't disguise the fact that we haven't been good enough - and that's the bottom line," said Waterworth. "We want to cement third place. If we do that, it's then wait and see. "There could be a million reasons why we haven't performed. And, realistically, third place isn't even good enough for a club of Linfield's tradition. "I just don't know. We have been working hard in training and haven't dropped our fitness levels. But when it came to the crunch in certain games, we just haven't turned up. "It would be fair to say that we've been unpredictable." Waterworth, however, insists it's vital the Blues meet the challenge of their final two games - against Coleraine and Cliftonville next week - head on. "Glenavon are on the box seat for third spot, but that could change very quickly," added Waterworth, who serves a one-game ban tomorrow. "Coleraine are in the running for the title and they'll be giving it their all. "People have been saying that we have reserved some of our worst performances for Windsor Park and that there is a lack of atmosphere at times. "But I don't buy into that. It's a fantastic venue and a great stadium. I don't think our performances have anything to do with that. "It's down to the players, who have been frustrated more than anyone else. We have the chance ending the season on a high by qualifying for Europe. It's the minimum requirement." Blues boss David Healy wasn't happy with his team's offering last weekend, but he believes his boys can bounce back from their defeat by Crusaders. "It was disappointing because we went into the game on the back of some decent results," he said. "Getting to Europe is now our aim. I don't care whether it's through the front door, the back door or the side door. But we must get there."